"Everything you need to respond and hire as demand for IT Professionals increases" - CIO Fortune 500"
IT Hiring Kit Job Descriptions Salary Survey - Building the IT Staff your company needs to succeed requires offering the right jobs at the right salary levels. Only the IT Hiring Resource Kit provides the industry-standard job descriptions and up-to-date salary data you need to recruit top talent as effectively and efficiently as possible. Hiring the right people is critical. Ask employees and new hires who’s the best person they ever worked with - and then go after those people. While you’re going after your competitors’ stars, always assume they’re doing the same. Once you make hires, do all the follow-up and training necessary to ensure they’re in the right jobs. If employees don’t work out, cut your losses quickly. The first step every enterprise needs to take is to see they have the right tools in place. 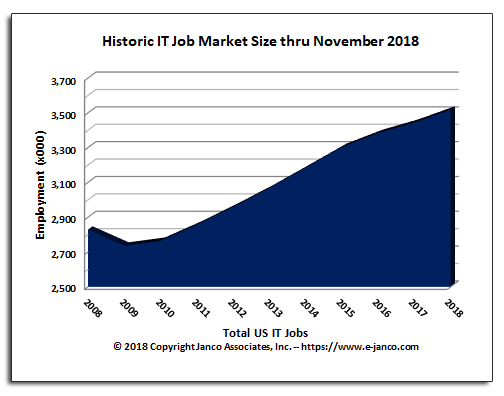 eJobDescription and Janco have assembled the IT Hiring Kit,the indispensable resource that provides CIO, IT Managers, and HR professionals with everything they need to hire and retain the best talent. It includes up-to-date salary data gathered through an extensive survey of businesses throughout the United States and Canada, plus polished job descriptions for the 73 IT positions surveyed. This proprietary information will reduce the time it takes to recruit top talent and ensure that you get the right person for each job. Interview and Hiring Guide (WORD and PDF)- Provides a process, forms, questions to ask and not, while meeting mandated requirements. Anyone conducting an interview should be aware of questions that are illegal to ask prospective employees. Many illegal questions are easy for just about anyone with elementary social graces to avoid, but others might surprise you. In general, you should not ask an interviewee about their age, race, national origin, marital or parental status, or disabilities.